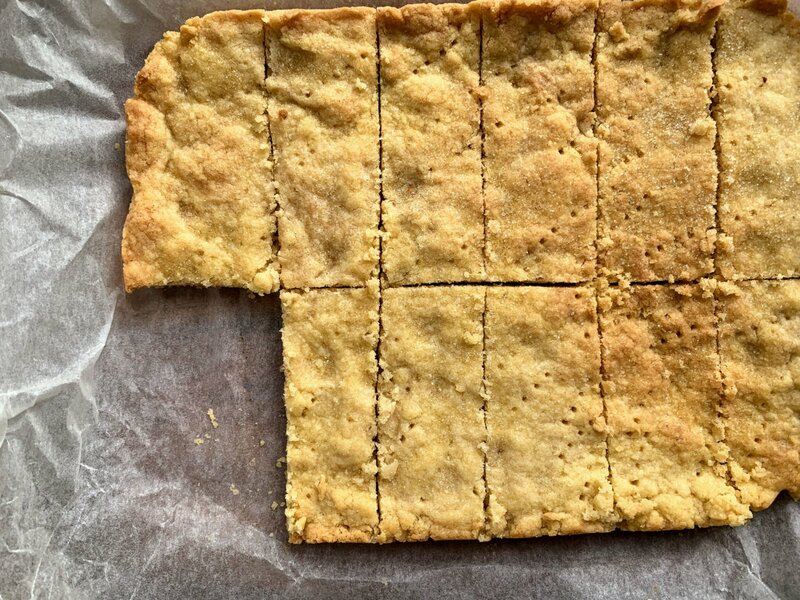 I’m trying to show my sons that not everything comes from a supermarket so this morning I baked these simple and delicious shortbread biscuits with them. They love baking! Put the butter and 70g of sugar into a food mixer and cream together for a couple of minutes. Add the flour to the mixer and mix again until the flour resembles breadcrumbs. Line a small ovenproof dish or baking tray with baking parchment (mine is approximately 26 x 19cm). Pour the crumbly mixture into the baking tray and flatten with your hands until smooth. Cover the tray with clingfilm and refrigerate for 30 minutes or pop it into the freezer for 15 minutes. Pre-heat your oven to 180°C fan/400°F. Remove the cling film and lightly pierce the surface with a fork and sprinkle over the remaining sugar. Bake for 20-25 minutes or until the biscuit is starting to turn golden brown. Remove the baking tray from the oven and using a knife cut the shortbread into slices while it’s still warm. Allow the shortbread to completely cool in the tin before removing it. Using the baking parchment, gently lift the shortbread out of the baking tray and resist the urge to eat it all at once! The shortbread will keep for approximately 7 days in an airtight container – if it lasts that long that is! You can refrigerate the mixture but my boys wanted biscuits so I used the freezer with great sucess!